Ski holidays in the 4 Valleys offer access to the biggest ski area in Switzerland and one of the biggest in the whole of the Alps - getting bored is not an option. Linking the villages of Verbier, Nendaz, Veysonnaz and Thyons - Les Collons, Tzoumaz the 4 Valleys area in the Valais Canton boasts an incredible 412km of pistes. The 4 Valleys hosts the 'Freeride World Tour on the Bec Des Rosses' north face, proving the scale of the mountains in the area. With high altitude skiing and guaranteed snow, any of the resorts in the 4 Valleys is a reliable base from which to enjoy the fabulous ski terrain. The 4 Valleys area is only a 2 hour drive or 3 hour train journey from Geneva Airport so offers a very easy and stress free transfer. Whilst a taxi from Geneva ranges in price depending on the time of the year the train is always close to 60CHF which is very reasonable. The journey around the north shore of Lake Geneva is a scenic joy and with an easy change of train in the valley town of Martigny you arrive in Le Chable. From here it's only a 10 minute gondola ride to the centre of Verbier although do bear in mind that the gondola link is only open during the day. Arrive at night and you will need to take a short taxi ride up from Le Chable to Verbier. 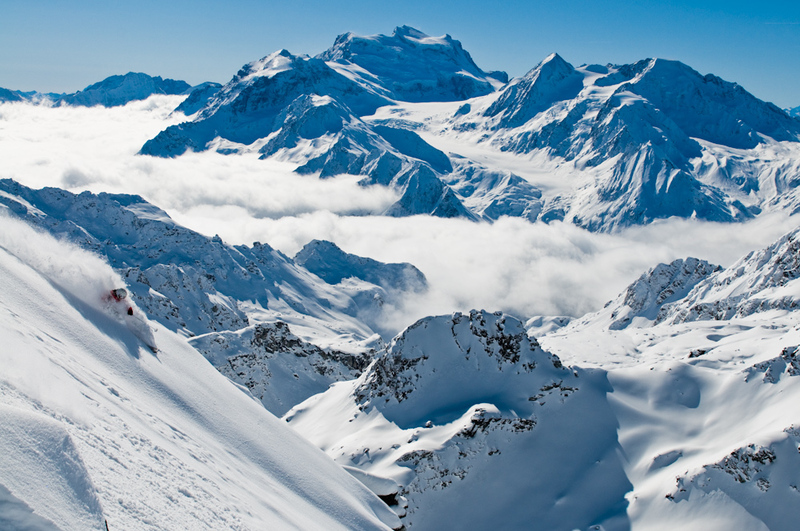 Verbier is the most famous ski resort of the 4 Valleys. The sprawling town is picturesque with a busy town centre surrounded by quieter outlying residential areas. A regular bus service runs throughout the town connecting the various areas to either the Savoleyres side of the main Verbier bowl or to the Medran gondola station which accesses the other side. The main Medran gondola takes skiers from 1,500m to 2,700m at Attelas or Fontanet in just two stops and 11 minutes and from here the great expanse of the 4 valleys is completely accessible. More than enough for a week's skiing even for good skiers. For experts Mont Gele (3,023m) can be reached without even having to put on a pair of skis. After a heavy snowfall areas like this are what makes Verbier a truly magnificent place to ski and from Verbier's highest peaks you will find some of the greatest skiing in World. The top of Mont Fort stands tall at 3,330m with a spectacular view of the Alps with Mont Blanc in one direction and the Matterhorn Mountain in the other. For those unsure about heading up to Mont Fort the gentle bowl of La Chaux at the foot of Mont-Fort, which is almost always sunny, is enough to keep everyone entertained whilst the very brave tackle the big mountain. With a snow park suitable for all abilities as well as easy rolling red and blue runs (quieter than the rest of the resort) it makes for a great family friendly day on the slopes. 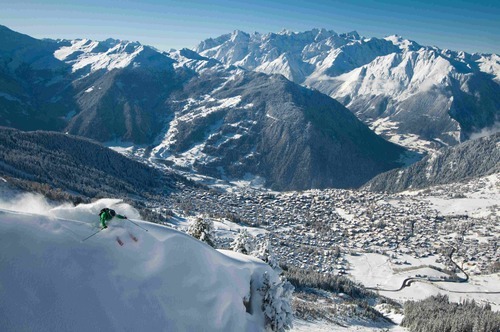 On the other side of the main valley and only accessible from the main resort of Verbier is Brusson. On a bad weather day this area offers amazing tree skiing. Brusson up until recently was hard to access but is now joined to Verbier by a one-stop gondola. Previously it was a best kept secret by the locals but the cat is now well and truly out of the bag. Verbier is certainly much more suited for the intermediate to experienced skier. With only two green runs separated from the rest of the mountains it can be hard for the beginner to quickly progress to the harder blues found above the Medran. A ski holiday in Verbier not only promises snow and amazing skiing but also a vibrant nightlife and apres ski scene as well. With the piste-side W-Bar found immediately on your arrival back into Verbier the partying starts with your ski boots still on. Being situated right next to the main bus stop this bar acts as a great focal point to meet with friends at the end of the day. Close by is the Pub Mont Fort where you can play darts and enjoy the resort's cheapest jugs of beer. The nachos here are also one of Verbier’s highlights. With nearly 60 chalets in Verbier we have a wide range of choice to suit all groups. The Chalet Rosalp in the centre of town is only a 100 metre walk away from the main Medran gondola and is not only super convenient but also affordable. The W-Hotel is a ski-in property situated in the heart of the après ski scene. With state of the art design and architecture the funky and innovative interior never fails to impress. The satellite villages of Verbier are Nendaz, Veysonnaz, Thyons – Les Collons and Tzoumaz. They are all much quieter than Verbier at night but have easy access to the same fantastic ski area. More family orientated these resorts are great if you have children or less experienced skiers in your group as their quiet, snow-sure pistes are a great learning platform. Shops and bars in these satellite villages are a fraction of the price compared to those in Verbier. Nendaz (1,350m), Veysonnaz (1,470m), Thyons – Les Collons (1,300m) and Tzoumaz (1,510m) are all very snow-sure offering mostly north facing slopes that hold their snow cover until late in the season. We have some great value chalets in the quieter ski resorts of the 4 valleys so if you want to experience the same awesome skiing as Verbier but at a lesser cost we recommend one of these properties. Ski Holidays in the 4 Valleys don’t have to be all about skiing. The area has a large network of mountain trails suitable for winter walking. Although these can be tackled in walking boots, snow shoes can also be rented if you want to go further afield and experience some truly magnificent mountain views. La Chaux is a relatively easy 2 hour walk from Verbier and is also a great spectator point for the ‘Xtreme Verbier, Freeride World Tour’ event. An evening ride a on 'piste basher' makes for a breathtaking experience as you get to see the mountains during twilight. Tandem paraglider flights can also be booked or why not enjoy a round of golf on snow at Tortin? Clubs can be rented. There is also an exciting 10km toboggan run from Savoleyres to Tzoumaz which can be enjoyed by all the family. Ski holidays in the 4 Valleys area of Switzerland provide thrills both on and off the mountain!